Home /Hare Krishna, Knowledge/The Power of Yoga can Make a Yogi Live without Food and Water for 70 years! How many of you can sustain Nirjal Vrat (no water fast) for a single day. It is very hard to remain energetic without water for 12 hours at a stretch, that is the reason we hardly find real bhakts among common people who can practice Nirjala Upvas for 24 hours. Though there are devotees who observe such fasts in Krishna Janmasthmi or Hindu married women in North India fast from sunrise to moonrise on Karva Chauth for the safety and longevity of their husbands. It is highly advised NEVER to harm ownself to please God. If you cannot remain 24 hours without water or food then do not indulge into such acts as it will be sinful to harm any Jeev including yourself on spiritual days and festivals. To make our body stronger and oblivion to the fasting repercussions we need to meditate very hard practicing Vedic norms of meditation. 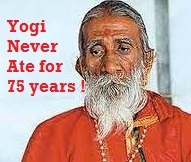 However there is one Yogi in India who claims to sustain without water and food for almost 75 years! ‘Prahlad Jani’ who is fondly known as ‘Mataji’ claims to have ability to absorb energy through chanting to keep his body alive. If one is able to become disciple of Yogi Prahlad Jani and learn the secrets of his survival then replicating his way of life might not be that hard. 1 Who is Prahlad Jani ? Who is Prahlad Jani ? 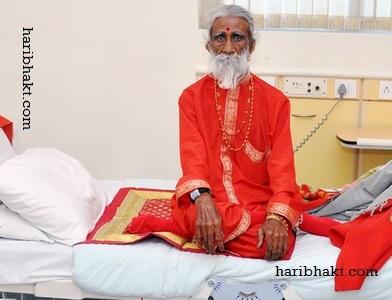 Prahlad Jani is a Sadhu, who says he never took food or water since 1940, almost 75 years. Born Prahlad Jani, he grew up in Charada village in Mehsana district. According to Jani, he left his home in Rajasthan at the age of seven, and went to live in the jungle. At the age of 7, Jani underwent a spiritual experience and became a follower of the Hindu goddess Amba. From that time, he chose to dress as a female devotee of Amba, wearing a red sari-like garment, jewellery and crimson flowers in his shoulder-length hair. That is the reason Prahlad Jani is commonly known as Mataji. Jani believes that the goddess provides him a liquid sustenance or “nectar,” which drops down through a hole in his palate, allowing him to live without food or water. Since the 1970s, Jani has lived as a hermit in a cave in the rainforest near the Gujarati temple of Ambaji, waking at 4 am each day and spending most of his time meditating. Reuters also had reported: In a country remarkable for tales powerful deities and exotic mystics, an 84-year-old man who claims he can survive without food or drink has baffled doctors who studied him and did not see him eat or drink anything for more than two weeks. Being Hindu Sage, Prahlad Jani, says he chants Vedic mantras and meditates remembering goddess Amba to remain alive. To date two observation studies on Jani have been conducted. 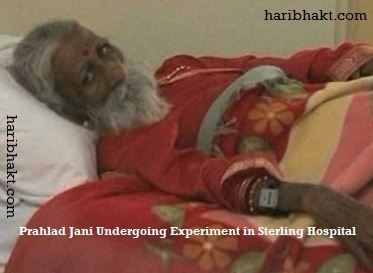 Jani spent more than two weeks in April and May under the observation of doctors at Sterling Hospital in the western Indian city of Ahmedabad. “We studied him for 15 days with him taking no water or food,” Dr. Sudhir Shah had told ABC News. Shah said that Jani gargled water and took baths, but consumed nothing. One was in 2003 and another one in 2010. In 2010, he was under video surveillance of 3 cameras 24×7 for 15 days. About 35 scientists from Defence Institute of Physiology and Allied Sciences monitored his health all through 15 days. Yet they didn’t find any evidence that Jani ate or drank anything during the 15-day ordeal. Till the end investigators did not find any adverse effects in his body from hunger or dehydration. One possible explanation given was that yoga exercises may have altered Jani’s body to undergo a biological transformation. According to Daily Mail reports, doctors said that after fasting for two weeks, Jani was healthier than the average 40-year-old. Clinical, biochemical, radiological, and other relevant examinations done on Prahlad Jani reported him to be within safe range throughout the study. The possible reason behind his survival without essential elements for sustainment of life continues to baffle scientists both home and abroad. Perhaps as equally interesting for the doctors was the fact that Jani passed no urine or stool during the time period. Shah said the normally when someone has no stool or urine, they need dialysis. The experts doubted initially, after tests confirmed Jani’s ability to survive without food or water. Jani has confounded the scientists. “We are studying the phenomenon,” Shah said. The scientific research may be able to help soldiers or disaster victims live without food or water for longer stretches of time. Dr. Michael Van Rooyen, director of the Harvard Humanitarian Initiative, dismissed the observation results as “impossible”, observing that the bodies of profoundly malnourished people quickly consume their own body’s resources, resulting in liver failure, tachycardia and heart strain. A spokeswoman for the American Dietetic Association remarked that the human body could survive on water alone, although not healthily, and that a person could not expect to meet their body’s vitamin and mineral requirements without ingesting food. Other scientists and skeptics like Sanal Edamaruku and Peter Clifton also disagreed stating that one can survive with water for 3 to 4 days but it is not possible may be during bathing or gargling he took some water. If it was so easy for Sanal Edamaruku and Peter Clifton to sustain merely by bathing or gargling water then they should repeat the feat for just 4 days but without releasing urine and stool as done by Prahlad Jani. However Jani took the testing experiment to 15 days under Video surveillance. When probed to give scientific reason how one can sustain with gargling water for 4 days, has anyone tested this before, Sanal got blank faced. Background of Sanal Edamaruku shows that he is self-proclaimed rationalist and founder president of the Indian Rationalist Association but has Christian leanings and never strongly object to non-Vedic practices with same vigor, so his skepticism is as shallow as his beliefs. But scientists who conducted tests wanted to know the reason for survival of Prahlad Jani. That is a moot question whose answer, Indian scientists hope to find out. There was noble reason behind the tests. Vedic meditation is eternal, does not need testimonial of great Yogi Prahlad Jani but unraveling the secret can help millions across the earth to fight with poverty and sustain the famine. “We realized that, if this whole phenomenon really exists in a human being even for 15 days, it would have immense application in unraveling secrets of medical science and its application for human welfare,” a statement from a scientific group, that included the Defence Institute of Physiology and Allied Sciences, said. “Instead of ignoring this case, we selected to investigate further, in a rational and scientific way. We again make it clear that the purpose of this study was not to prove or disprove a person, but to explore a possibility in science and study a new phenomenon,” the statement clarified. While thin, Jani is internally healthy, doctors said. “Somebody doesn’t take water for seven or eight days he surely dies,” Shah had said but Prahlad Jani is living strong without any disease. Trailanga Swamiji (hindu yogi and born in varanasi) really lived in 280 years ??????????? There are many Rishis doing penance in Himalay who are alive since 500 years. They are considered pillars of Vedic knowledge. They are protecting human race with their penance. It is penance of these great Rishis that in due of course of kaliyug we will find births of great devotees like Tulsidas and more wherever there is huge denigration of Sanatan Dharma from forces external to Bharat. These devotees will help in keeping some Dharmic qualities intact among few people which will form the basis of Dharmic resurrection whenever Dharma diminishes in the middle years of Kaliyug and especially at the end of Kaliyug. he said to guru arjan dev that “ye kon sa Yug chal riha ha”??? You can meet him personally.